About four years ago someone sent us a descendant chart showing the descendants of Edmund Ellwood (1700-1789) and his wife Elizabeth Robinson (1700-?) of Dufton, Westmorland, England. It actually went back a few generations to an earlier Edmund, but the main descendants shown were those of Edmund and Elizabeth. It is mainly a list of names, with a few dates, but no places indicated. Unfortunately we don’t seem to have kept a record of who sent it to us, but we were told that it originated with a Peter Ellwood, whom we haven’t managed to make contact with. Since retiring last March, Val has been working her way through it, trying to flesh out the outline with dates, names and places, and trying to prove the various links. In the course of doing this she has discovered several errors and omissions in the list, and also several errors and omissions in various online family trees. She has mainly been working on the descendants of Edmund and Elizabeth’s eldest son Samuel Ellwood (1726-1796), who married Hannah Barrow at Cartmel in Lancashire in 1752. Samuel was a shoemaker, as were some of his descendants. Samuel & Hannah’s eldest son John seems to have gone back to Wesmorland for a wife, and married Jane Coulthred at Underbarrow in Westmorland, and they then had four children at Cartmell in Lancashire, but we have only been able to trace the descendants of one of them, Timothy Ellwood (1769-1867), who married Mary Withers in 1801. We are not absolutely sure of these links, but on a balance of probabilities they seem to be correct. If anyone has any better information about any of them, please let us know. Timothy and Mary had 12 children, and it is mainly their descendants that we have been trying to follow. The two eldest sons, John and Thomas, each had a daughter Agnes Ellwood, and each Agnes married in the 1850s, and emigrated to the USA soon afterwards. We’ve been able to find out what happened to these descendants mainly through the very useful Find-a-Grave web site. Agnes Ellwood (1831-1908), daughter of Thomas Ellwood and Elizabeth Taylor, married John Turner in 1852, and emigrated to the USA in about 1857, living first in Illonois, and then in Towanda, Kansas. You can find their details on the Find-a-Grave site here. They seem to have several children, some of whom are also buried in the same cemetery, and they can also be found on the Find-a-Grave site. Agnes Turner had a cousin, 15 months younger, Agnes Ellwood (1833-1896), the daughter of John Ellwood and Agnes Harrison, who married John Jackson Tallon in 1855, and almost immediately afterwards emigrated to Illinois in the USA. 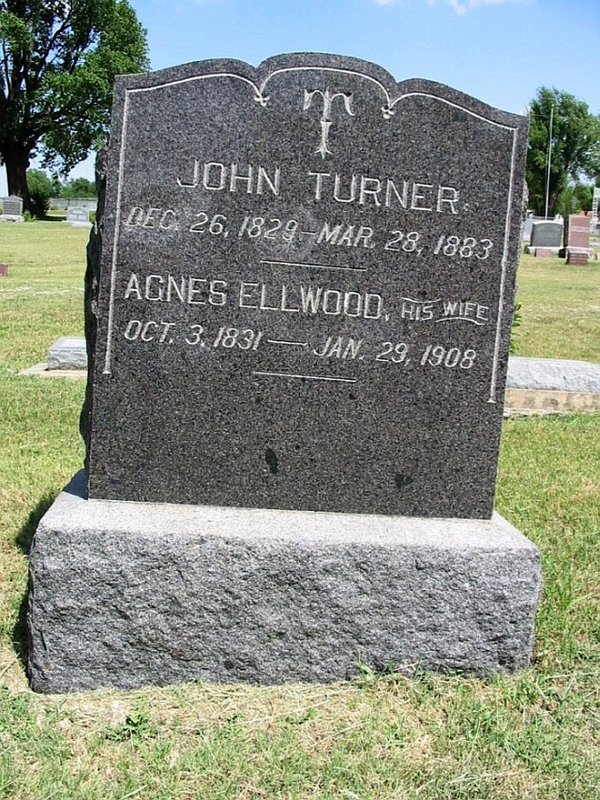 Unlike the Turner family, the Tallons seem to have stayed in Illinois a while longer, at least long enough for Agnes to be buried there. And again, Find-a-Grave comes up with the most useful information. It was at this point that we discovered a lot of online family trees for Agnes Ellwood Tallon, on the soon-to-be-closed Mundia site (no links, as they won’t work after September). And every one that we looked at linked to the wrong Agnes! They all linked to a third, unrelated Agnes, the daughter of John Ellwood and Mary Shepherd, who was born about 1835 in Oddendale, Westmorland, England. 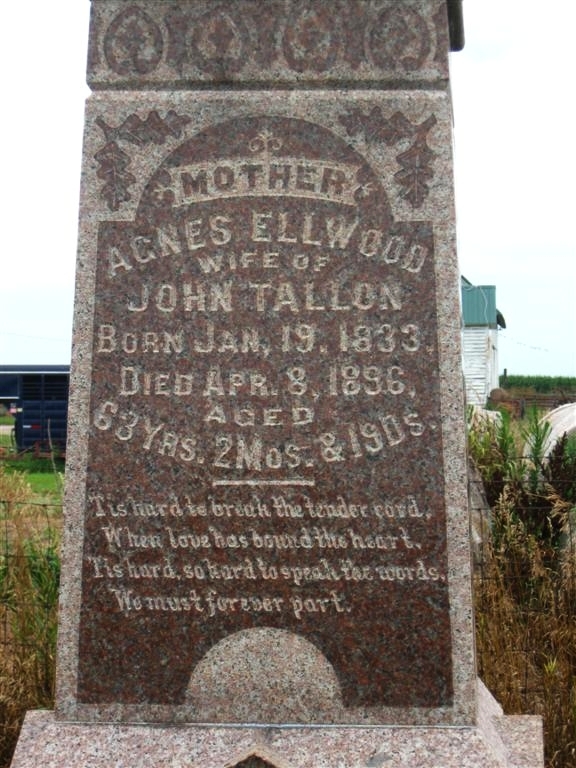 The “real” Agnes Ellwood married John Tallon in 1855, and was living in Illinois in 1860. In the 1861 English census the “false” Agnes Ellwood was still unmarried, still living with her parents, working as a dairymaid. In 1868 she married James Coulthwaite in Casterton, Westmorland, and they had a son John Henry Coulthwaite, who had a large family, and his mother Agnes was still living with them on the farm in Westmorland in 1911. The Ellwood family seems to be a good one for showing the danger of online family trees, and of copying them without checking. We gave another example of this in our blog post on Jane Ellwood and the perils of online family trees. But the truth about the “real” Agnes Ellwood who married John Jackson Tallon was there on her gravestone all along. 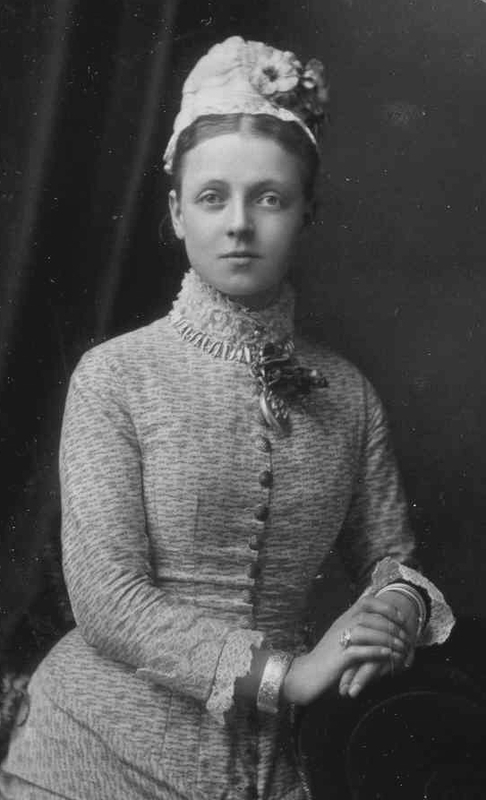 She was born in 1833, not 1835, and so is much more likely to be the Agnes Ellwood, daughter of John Ellwood and Agnes Harrison, who was baptised in Colton, Lancashire on 10 February 1833 than she is to be the Agnes Ellwood who was born in Oddendale and baptised on 14 June 1835 in Crosby Ravensworth, Westmorland, daughter of John Ellwood and Mary Shepherd. We haven’t reported much here for a while, but it’s not for lack of research. We’ve actually been busier on family history research in the last couple of months than we have for a long time. Val has been going through a family tree on the Ellwood family that someone sent us a while back, trying to verify and extend the descendant lines, mainly from Samuel Ellwood, son of Edmund Ellwood and Elizabeth Robinson of Westmorland, England. Samuels descendants seemed to live mainly in the Cartmel area of Lancashire, and spread out from there. I’ve been chasing up some loose ends on the Cottam and Bagot families of Lancashire and will write more when I’ve checked some of the them. For the past few days I’ve been trying to find out more about Bessie Bagot and her relatives. In the 1861 Census of Chorlton-upon-Medlock in Lancashire, England, she is shown, aged 5, staying with her cousins John and Mary Worrall. That means she was born about 1856. Mary Worrall’s maiden name was Cottam, and her mother was Margaret Bagot, born in 1811. So Margaret Bagot must have been Bessie’s aunt, and since Bessie was a lot younger than her married cousin Mary Worrall, her father must have been one of Margaret’s younger brothers. None of the census records, however, give a clue to Bessie’s parentage. She was brought up by other relatives — uncles, aunts and cousins. The 1881 Census is no more helpful. Bessie was then about 25, and it was a couple of years after the photo was taken. The “Betty A. Bagot” is probably Betsey Alice Bagot, a younger sister of Margaret Cottam (nee Bagot). So that would make Bessie Betsy’s niece in the strict sense of the word, as the daughter of a sibling. But which sibling? There is a Robert Bagot born in 1814, and a Thomas born in 1821. Neither of them appears in the 1881 Census. Thomas appears in 1861, as a widower, a painter, living in Chorlton, not far from the Worralls, where Bessie is staying. That makes sense. He can’t look after an infant daughter while he’s out working all day, so let his niece, Mary Worrall, married with no kids, look after her. And then the Worralls start having children of their own and move to London, which would be too far away for Thomas to see her regularly, so he asks his unmarried sister Betsy to look after young Bessie. Betsy is living with unmarried cousins Robert and Margaret Richmond, and that seems to be a long-term arrangement, at least as far as Robert was concerned, and young Bessie seems to have been brought up by them after the Worralls moved to London. This was confirmed by Robert Jordan, a descendant of Bessie, who had a copy of her baptism entry at St Peter’s Church, Liverpool, where she was baptised on 15 September 1864, and her parents are recorded as Thomas and Ann Bagot. But that raises some more questions: Bessie was in fact born in Liverpool, but she never grew up there. In 1861 she was living at Chorlton, in 1881 she was at Birkdale, near Southport, both quite some distance from Liverpool. So why did someone, presumably her aunt Betsy Alice Bagot, take her all the way to Liverpool to be baptised at the age of 8? In Loving Memory of Robert Richmond who died 29 October 1895 aged 70 years. “Thine eyes shall see the King in his beauty.” Isaiah XXXIII 17. Also of Betsy Alice Bagot who fell asleep at Birkdale 6th July 1905 in her 88th year. “In my father’s house are many mansions … I go to prepare a place for you.” St. John XIV 2. Also of James Smith Breeze born 15th of June 1858. Fell asleep 25th of August 1916. [Biblical quotation is illegible]. Betsy Bagot and Robert Richmond were related, but how? Robert Richmond was born about 1825, and there was a Robert born around then who had a sister Margaret, children of Thomas and Alice Richmond. In 1851 Robert was staying with an uncle Henry Richmond. But which one of Robert’s uncles or aunts married a Bagot, or, possibly, a Mashiter? Or was his mother Alice possibly a Mashiter or a Bagot? Just to confuse things still further, there is another Robert Richmond, born about 1833. His sister Betsy Richmond married John Cottam in 1852, and that John Cottam was the brother of Richard Cottam who married Margaret Bagot, the sister of Betsy Alice Bagot who lived with her cousin Robert Richmond. And there is the possibility that one or both of the Roberts’ middle name was Casson. If anyone can help us to find our way through tat tangled web, please join us on the Bagot Forum! Yesterday I spent a couple of hours in the LDS family history library in Parktown, Johannesburg, looking at bishops transcripts of parish records from Lanacaster, Lancashire, England.The families i was looking for were Cottam, Bagot (or Bagott) and Mashiter. Some of the pages were damaged, so I wasn’t able to read the full record, and none of the people I found in the records appeared to be related — yet. But in some ways the Bishops Transcripts were more useful than the original registers, as they showed separately the baptisms, marriages and burials that took place in the different chapelries in the parish. NAME: COTTAM, Richard, Born ??? 1812 in Heaton with Oxcliffe, Died ??? 4. M COTTAM, James, born Jul 1841 in Manchester, died ??? I’m especially interested in finding Richard Cottam’s parents, as that might link him to a lot of other Cottams that lived in the area.